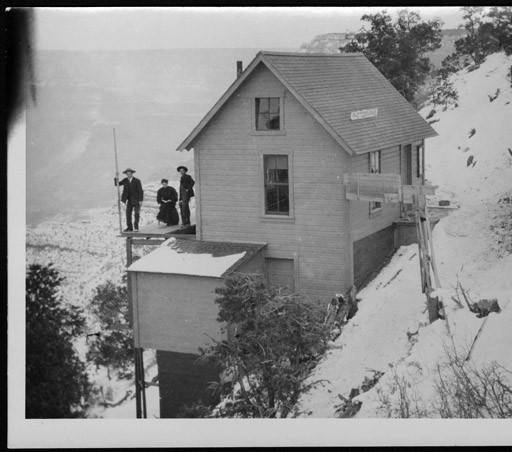 Ellsworth and Emery Kolb came to the Grand Canyon in 1902 and began building the studio in 1904. It was complete in 1926 but has undergone various expansions since then. The two began selling photos of tourists at their studio. These photos were taken as mule rides descended into the canyon. One of the brothers would run down to Phantom Ranch to retrieve water for the photos and run back up - a nearly 10-mile one-way trip that would occur up to 9 times a day. The pictures would be developed before the mule train returned and tourists were able to leave with documentation of their adventures. It proved to be a very fruitful business despite the demanding work. Ellsworth eventually left the canyon but Emery remained and ran the studio until his death in 1976. After he passed, the studio came under NPS control. Since then the Grand Canyon Association has maintained the building and has completed a major restoration project (2014). It operates today as an art gallery, bookstore, and information stop. The studio is next to the Bright Angel trailhead. The Kolb film of their 1911 trip down the Colorado River played in the studio from 1911-1976, setting the record for the longest continual showing of a film. Clips of the film are still shown in the studio today. 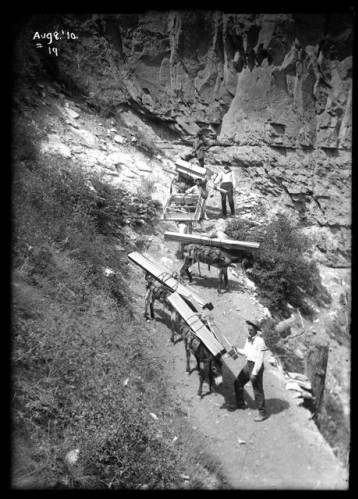 'How We Brought in the Lumber To Build a Studio in the Canyon' [National Geographic, August 1914, p. 130].